My old buddy MP dropped me a mail with a new bikenstein! not terrible busy at work today (some people might disagree…), so I decided to do a bikenstein (sideburn) Dirt Quake II special! 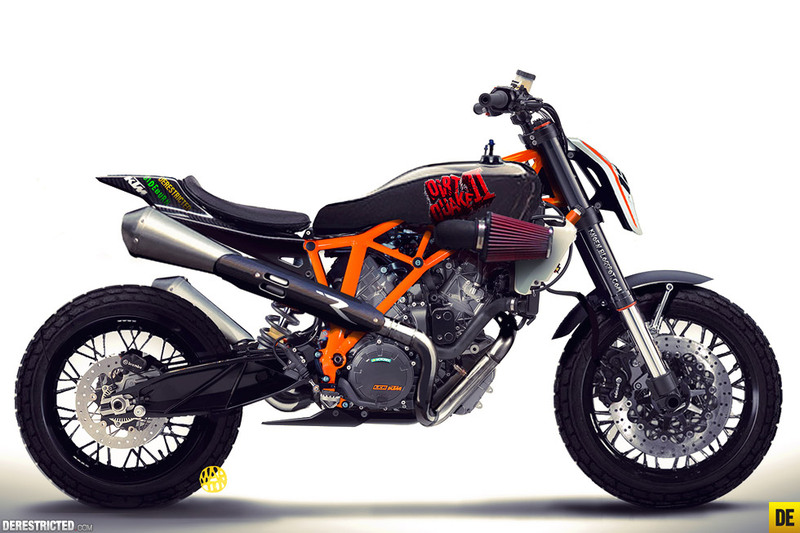 Based on the new KTM 1190 adv. it’s also a bit of Bott XR, a drop of Deus and Radical Ducati topped of with a Jason Poznat tank, is it a recipe for success you reckon? Or is it rather a combo to get yourself killed? I’m blogging again btw, please pop by! That's my kind of crazy! The Bikenstein bikes are the most wanted content here at Derestricted blog for me! I always hope to see some of your and Piers wild ideas when I check it. The Husaberg 570 supermoto is your design as well right, Martin? I ride one nowadays and I love it! e si questa è la moto dell"amore….si possono provare tutte emozioni in qualsiasi posizioni de camasudra..